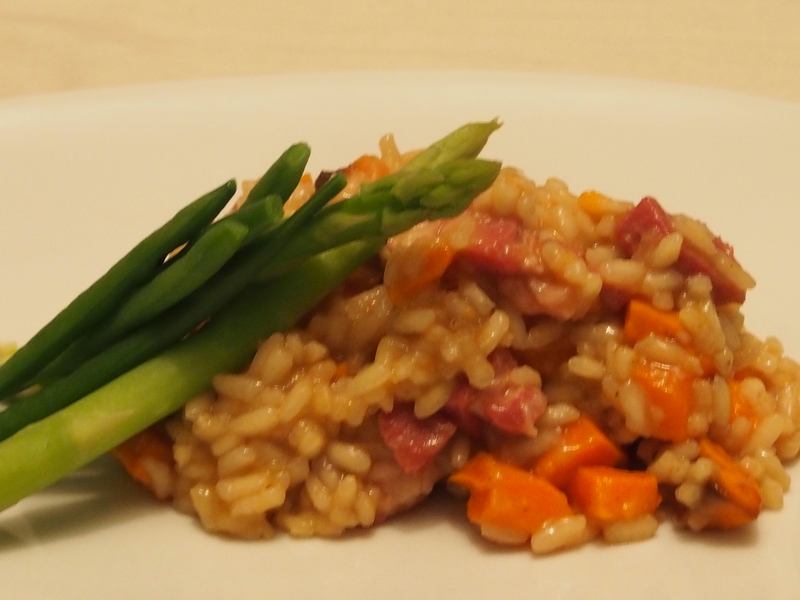 Risotto is one of the most versatile dishes, you can basically put anything in it. I used to think it was a really difficult dish where you had to balance the liquid adding it ladle full at a time- but it works just as well this way!we tend to have it as a pot luck dish and always have a bit of pancetta in the freezer and Sweet Potato is now in season. You can equally make delicious vegetarian (pea, asparagus butter nut squash, Jerusalem artichoke all work well) risotto or leftover roast chicken, lamb or beef works well too. The base for us always stays the same. Put the Sweet Potato into an oven proof dish and cover with the olive oil and salt and pepper. cook in the oven at 200 for 15-20 mins until soft. Meanwhile, fry off pancetta and add onion garlic and ginger. Add rice and fry for 1 min. Add liquid and bring to the boil. Reduce to a simmer stirring frequently until starting to thicken. This can take any time between 20 and 40 mins depending on if you have Gas or Halogen in my experience!. When liquid almost disappeared add roasted Sweet Potato and pecarino. salt and pepper to taste. Steam Asparagus and plate up! If you have leftovers, out in the fridge. The next day ball them up, flour them and fry them in some coconut oil and have risotto balls for lunch or snack- also great finger food for kids!